Join Tanguísimo today, and make dance and music part of your life! You can learn, practice, party, and enjoy shows and concerts all in one place! 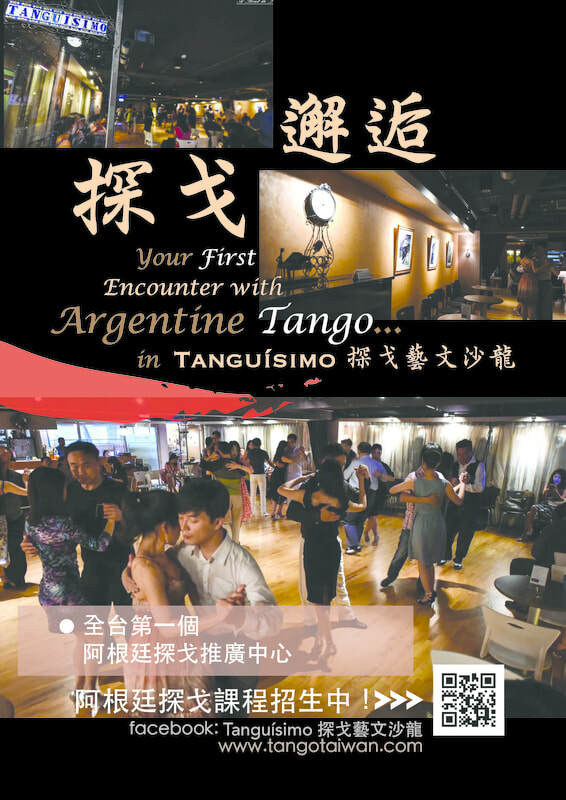 Entering its 11th year, Tanguísimo was founded as the first Argentine Tango studio in Taiwan, offering classes, parties, talks, workshops, live concerts and dance shows. Hundreds of people come and enjoy a lifestyle with music and dance, so what are you waiting for! Saturday 14:00~15:20 Starts on May 18th, 2019. Tango is a social dance based on the main characteristics of the dance: improvisation, embrace and walk. More than an activity for the body, it also serves as a way of expression for our sentiments in daily life. Tango Beginners Course starts with the practice of connection and weight, followed by walk and turns and their basic applications. Our course is designed as "Buy 1 get 1 for free", which means the student can take the course twice while paying only once, thus creating an environment of reassurance and steady growth. Tanguísimo Tango Space, the first Argentine tango studio in Taiwan founded in 2008, has a strong team of teachers and guest teachers and offers all levels of tango classes from beginners and basic to intermediate and advanced. Address: 7F-4, No. 169, Sec. 4, Zhongxiao East Road, Daan District, Taipei.